Dental sealants are very thin slivers of plastic resin that are used to cover the back teeth and prevent both decay and cavities. They are an excellent, unobtrusive, preventative measure that can be applied very quickly by the dentist, with no discomfort to the patient. By far the most suitable candidates for dental sealants are children and teens. Children from the age of five to 15 will benefit the most from sealants. If the sealants are applied just after the first molars have erupted then there will be less chance of cavity causing bacteria invading the teeth. Adults can also benefit from dental sealants as the bacteria has less chance of causing decay once the sealants are applied. Sealants are made from very thin plastic and when applied to the molars the plastic fills the pits and fissures of the tooth, forming a barrier between teeth and plaque. Due to the location on the back teeth, the sealants are practically invisible to the naked eye, and can be white, translucent or tinted. The longer bacteria and plaque stays on the teeth, the more chance there is of decay and infection occurring. Children and young adults are very susceptible to decay, and almost 90 percent of decay occurs to the chewing surfaces. Even if children and teens adhere to an adequate at home dental care routine, there is still the chance of plaque attacking the teeth. Think about lunchtimes when children consume food and fizzy drinks, and then teeth are not usually cleaned until bedtime. The acids from the food and drink will remain on the teeth and attack the teeth and gums, especially the chewing surfaces. Dental sealants provide a barrier between the teeth and bacteria, and prevent tooth decay from occurring. The process of applying a dental sealant is extremely simple. 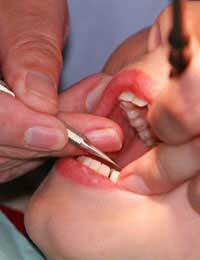 The surface of the tooth will be thoroughly cleaned using a brush, dental drill or air abrasion. A gel or roughing solution is then placed on the tooth in order to help the sealant stick to the tooth properly. Next the sealant itself will be painted onto the tooth; the sealant at this stage is liquid plastic and will stick to the grooves and pits of the tooth. The sealant will then be hardened using a special light. The dentist will check the patients bite response and make any necessary adjustments, and the procedure is complete. Sealants will usually last from between three to five years, although a much longer timescale of around 10 years has been known. If any part of the sealant does chip or break off then a dentist should be consulted and the sealant will be reapplied. Chipping or breaking can happen if the sealant was not kept dry enough during the application process. Dental sealants do not mean that the wearer now no longer has to brush or floss their teeth. Sealants are usually only placed on the back, chewing teeth, where most decay occurs. It is still vital to adhere to a regular brushing and flossing routine in order to prevent tooth decay and gum disease. Dental sealants are an important, additional preventative measure that anyone can benefit from, particularly children and teens. The sealants will dramatically cut the risk of infection and decay to the back teeth and can stop cavities occurring to these teeth long after the sealants have been applied.